Keep a close eye on your puppy during housetraining. The first order of business with a new puppy is housetraining. Once your pup understands he needs to do his business outside, both of you will be a lot happier. While many people use a crate when housetraining, it isn't strictly necessary. Set up your puppy's home. While he can hang out with you while you're around to pay attention to him, he needs a safe spot where he can stay out of trouble and not get hurt while you are away. Bathrooms and kitchens are typically good spots, as the flooring is made for easy cleanup and there isn't a lot of furniture to tempt a teething pup. Secure the doorway with a baby gate. This spot, with his food and water dishes, is where he will spend time when you cannot watch him. Because dogs naturally want to keep their home clean, he will be less likely to soil the area. The problem, of course, is a larger area, such as a spacious bathroom or kitchen, leaves him plenty of room to have accidents and still keep his eating and sleeping area clean. For this reason, the smaller the room, the better; a half bath or a baby gate set up halfway down a galley-style kitchen are good options. Feed your dog at the same time every day. Whether you are feeding him two, three or four times each day, keep a regular schedule. A regular feeding schedule makes housetraining go much smoother. Establish a schedule for taking your puppy out. Generally, he will need to go out when he wakes, before and after rowdy playtime, and after meals. Don't expect him to hold it longer than his age in months plus one. For example, a 4-month-old puppy needs to go out at least every five hours, more often if he has eaten or been playing. Never make a dog hold it for more than eight hours. Watch your puppy carefully while he is in the house. If he starts exhibiting behaviors indicating that he needs to go out, such as circling, sniffing the floor or whining, take him out. If he has an accident, simply pick him up and take him outside, don't punish him. Reward your pup with a generous pat and "good dog," and maybe even a treat when he goes to the potty outside. If you reward and praise as soon as he does his business, he will quickly learn what you expect from him. Clean up any accidents immediately. 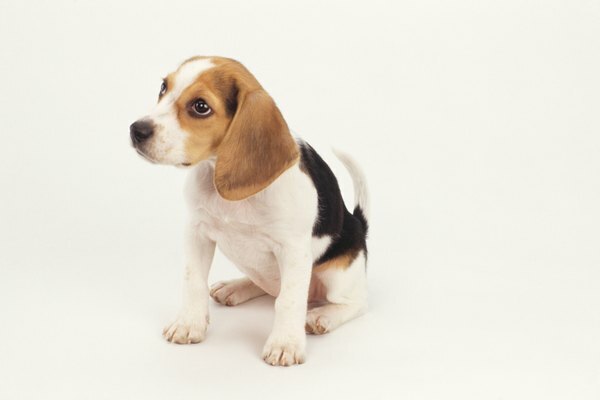 If there is any remaining odor, your puppy is likely to return to the same area to relieve himself. The key to successful housetraining is to take your puppy out often and reward him generously when he does his business outside. What Does a Flea Nest Look Like on a Cat? Is Play Growling Okay With a Dog? Can a Pomeranian Be Potty-Trained Indoors?